I have reviewed some really cool stuff and a lot of times I get the sake type of product just a different brand. This is another one of those. I have reviewed a few different kinds of Moscow Mule Mugs before but, I can honestly say, I have never reviewed on like this. 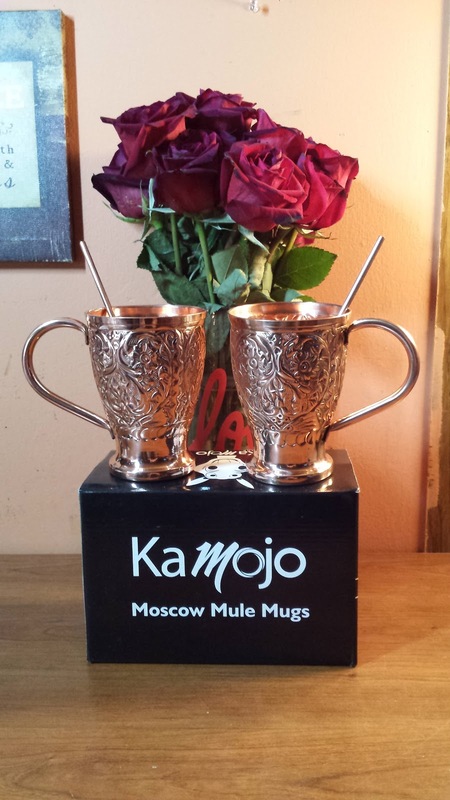 The Moscow Mule 100% Pure Copper Embossed Mugs by KaMojo are absolutely beautiful. The design is awesome and has so much detail in it. There are flowers and filigree in the design that give it such a unique look. The handles are easy to hold on to and have that really cool half heart look to them. I really like the look of these cups. It's a thin and lightweight cup almost delicate to the touch but very sturdy. I LOVE the way it gets cold. When I put the ice cubes and drink in there it's an instant change in temperature and it holds nicely. The box comes with the directions for the Moscow Mule Drink. What makes this set even more unique is the 100% Copper Straw/Stir Stick. I have never seen one of these before and I think it's pretty cool. I like to have a straw in my mixed drinks because they settle. Keeping the drink mixed and tasting evenly for the whole experience. The straw is thin enough to be a comfortable stirrer but also big enough to drink out of. It really is engineered nicely.